United Company Rusal appears to have been stripping assets from the Aluminium Smelter Company of Nigeria (Alscon) at the same time as it was creating large loan obligations which the loss-making smelter has little chance of repaying. Public protests got under way at Alscon, which is located at Ikot Abasi, in the southernmost corner of the country, after Rusal announced on March 26 it was sacking most of Alscon’s workforce. 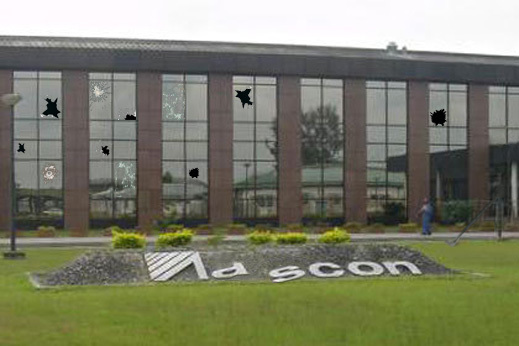 On April 14, Bassey Udo, a leading investigative journalist in Nigeria and business editor for The Premium Times in Abuja, reported details of the annual Alscon company report for 2011. This is the most recent annual report from Alscon on file. The details have been retrieved from the records of Nigeria’s Corporate Affairs Commission. KPMG, which is the designated auditor for Rusal’s consolidated financial reports, refuses to confirm that it provided a qualified report and notes to the Alscon filing. Udo reports he obtained the filing on application to CAC. Read Udo’s full report here. KPMG reportedly said its opinion on items in the Alscon accounts was qualified because the Rusal management had provided insufficient data. “Included in stocks are storeroom supplies carried at N5.9 billion as at 31 December, 2011. We were not provided with sufficient appropriate audit evidence as to the need to recognise a provision for stock obsolescence irrespective of the fact that some of the items have remained unused for several years,” KPMG reportedly wrote. In addition, KPMG said it was “also unable to carry out alternative audit procedures to obtain sufficient appropriate audit evidence due to the inability of the company to determine stock obsolescence. Consequently, we were unable to determine whether any adjustment to this balance is necessary”. At the current exchange rate 5.9 billion Nigerian naira are equivalent to $37.3 million. Rusal documents confirm the identity of Sea Chaika Corporation as a subsidiary of the Rusal group with rights to trade smelter products from Krasnoyarsk and other sources. The Nigerian filing reveals that Sea Chaika is registered in Belize. For a fuller account of the role of RTI in Rusal’s global operations, read here. At page 4 of the Alscon filing, the Lagos office of KPMG confirms that RTI has been supplying Alscon raw materials and taking out aluminium “under a tolling agreement”. No details of the terms are disclosed. At pages 8 and 9 of the report on Alscon, the auditors say that in addition to the problem of accounting for butts and storeroom supplies, there was another reason for their qualified opinion on Rusal’s financial presentation. That was the failure to disclose the Supreme Court litigation challenging the legality of Rusal’s ownership of the plant. “This uncertainty has not been disclosed in the financial statements.” Except for these qualifications, KPMG concluded that the data it had audited “give a true and fair view of the state of [af]fairs” at Alscon.” The significance of the accounting for butts and storeroom supplies is that it generates a one-off number which cuts by 86% the operating loss for the year. In a note to Rusal’s consolidated accounts for 2011, KPMG said it has “nothing to report…if, in our opinion…we have not received all the information and explanations we require for our audit.” There is no reference to Alscon in the consolidated financial report. In Rusal’s consolidated annual report for the same year, the only references to Alscon indicate that Rusal owns an 85% stake in the company; the 15% remainder is owned by the Nigerian government. The smelter is also reported as producing just 15,000 tonnes of aluminium that year, 16% of nameplate capacity of 96,000 tonnes. According to Udo’s report and other Nigerian media references to the KPMG filing for Alscon, the smelter company had total borrowings as of December 31, 2011, of N21.35 billion ($135 million). These included separate loans from several Rusal associated companies – Dayson Holding, N18.2 billion ($115 million); this is a British Virgin Islands entity through which Rusal had arranged its takeover of Alscon. Other loans reported by Alscon are from Sea Chaika, N455 million ($2.9 million); RUAL Ltd, N2.71 billion ($17 million; and RTI, N2.86 billion ($18.1 million). The report reveals that in the tolling arrangements, RTI owes much more to Alscon than Alscon owes RTI. According to KPMG’s note 23 on related party transactions, N708 million was owed by the smelter to RTI for alumina deliveries, while for aluminium RTI had exported and sold, RTI owed Alscon N2.86 billion. According to the annual Alscon report for 2011, the Nigerian plant had operating losses of N4.57billion in 2010, and N2.66billion in 2011. As of the end of that year, its current liabilities exceeded its current assets by about N7.2billion. Rusal’s head of public relations in Nigeria, Tatiana Smirnova, is reported by Udo as claiming his report is “false”. Nigeria’s highest court ruled last July that Rusal obtained control of the plant by an unlawful privatization process, and ordered the Bureau of Public Enterprises (BPE), the Nigerian privatization authority, to restore ownership to a Nigerian-American group, BFIG, which had been the high bidder in the initial privatization tender in 2004. That story can be read here. Reviews of the Nigerian ruling are under way in the federal US District Court in Los Angeles and in the London Court for International Arbitration. Smirnova confirmed by telephone what she had told Udo and other Nigerian reporters, adding that Rusal is now “discussing more detailed information regarding it.” She said Rusal spokesman in Moscow, Elena Morenko, is familiar with the Nigerian issues and can comment further. Contacted by telephone, Morenko refused to speak. Note: The full text of the KPMG filing can be read here. Strangely, at note 27 KPMG of Nigeria claims the “ultimate parent company” of Alscon is “the RUSAL GROUP, a company incorporated in Russia”. Elsewhere Rusal documents and KPMG reports identify the ultimate parent of the group as the Jersey-registered entity, United Company Rusal Plc.